Well, at least 2! I had made a banana bread and a banana cake a couple of weeks ago, and my sons had declined the bread but eaten the cake. And they were right - the bread had not much flavour. 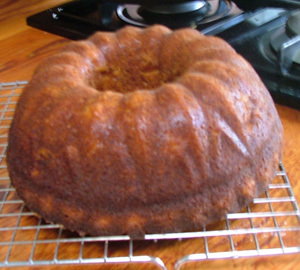 So, yesterday, with many very ripe bananas to hand, I decided to make 2 banana cakes. One is a recipe from Maureen Simpson, a well-known Australian cook from many years ago (she used to be heard on the ABC radio), and the other one was the one I had made a couple of weeks ago. It turns out that the only difference between the 2 was the number of bananas!! Maureen Simpson asks for 2, whereas the other cake asks for 3. And three is definitely the way to go!!! I overdid it (is that surprising!) as the second recipe asks for 3 bananas or 'just over a cup full of mashed banana'. And I had well over a cup! But the truth is, the more banana the better the flavour. 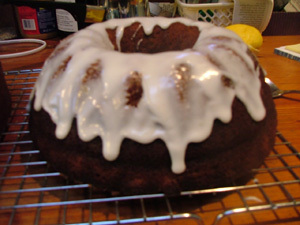 The drawback is that it makes for a very moist cake that gets more and more moist as the days go on. The answer to that - eat it fast! It's often difficult to find a good banana cake, but this is one is fabulous! Preheat oven to 180oC. Grease a ring tin or mould. Cream butter and sugar till light. Add vanilla, then each egg, beating well between eggs. Add mashed bananas. Sift flour with baking powder and bi-carb, then fold into banana mixture. Add milk and stir. 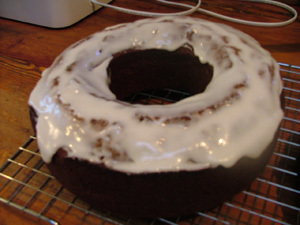 Turn into ring tin or mould, and bake for 45 minutes or until it shrinks away a little from the edges of the tin. Place icing sugar in a bowl and stir in lemon juice. Add melted butter and stir. Add a little hot water to the dish where the butter was, and pout it little by little into the icing sugar mixture, until you had a spreadable paste. 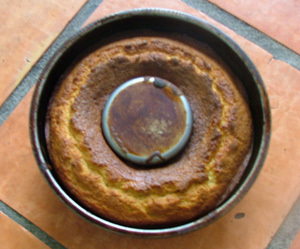 I like it quite thin on a banana cake, as you can see from the pictures below.